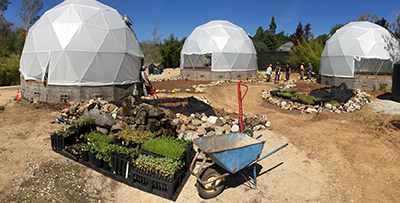 The grant will support operating costs for Future Garden for the Central Coast of California--a long-term environmental art installation by UCSC emeritus arts research professors Newton Harrison and his late wife Helen Mayer Harrison--that opened in May at the UC Santa Cruz Arboretum and Botanic Garden. Grants from the Andy Warhol Foundation are awarded for scholarly exhibitions at museums, curatorial research, visual arts programming at artist-centered organizations, artist residencies and commissions, arts writing, and efforts to promote the health, welfare, and first amendment rights of artists. UC Santa Cruz is one of 42 recipients selected from a pool of 224 nonprofit organizations. Working with botanists at the Arboretum--along with other artists, scientists, and students--the Harrisons have created trial gardens inside three refabricated geodesic domes, where native plant species are being exposed to the temperatures and water conditions that have been projected for the region in the near future. The goal of their project is to determine which plants will thrive as the area warms due to climate change, and to cultivate those species to create the foundation for a more rapid regeneration of the local ecosystem while temperatures shift. The Warhol Foundation previously awarded a grant to the campus in 2015 to support an innovative artist residency and exhibition developed by the Institute of the Arts and Sciences and the Institute of Contemporary Art (ICA) in San Jose--in collaboration with the UC Lick Observatory. That residency brought artist Russell Crotty, a 2015 Guggenheim Fellow, to the observatory to use Lick telescopes for direct observations and photographs that served as the basis for new, astronomy-based artworks.